Do you need to write a resume when you're just starting your career in the workplace? When you are writing a resume for an entry-level position, it will be more general than when you write a resume targeted for a higher level job. Writing a resume for an entry-level job can be daunting. If it will be your first paid, full-time job, you may feel like you have very little information to include on your resume. But even if you have little or no work experience, there are still plenty of details that are relevant. Plus, you may have more experience than you think. Remember, summer jobs, internships, and volunteer work demonstrate your responsibility as well as teaching skills. They can all be included on your resume. Contact information: Make sure to include your email, phone, and other contact information, so that it's easy for hiring managers to get in touch. Tip: Make sure your email address is professional — firstname.lastname@yahoo.com is preferable to lolcatfan4ever@yahoo.com. Work experience: You may not have held a full-time job before, but have you worked part-time? All sorts of experience are suitable to list, including summer jobs, internships, and volunteer positions. You can also include extracurricular activities. Education: As well as mentioning degrees, you can also break out relevant coursework, and include your GPA. Tip: Leave off your GPA if it's low. Skills: Include anything that might be helpful in the workplace, from the languages you speak to your proficiency level with computer programs and software. Headline or objective: This section is optional, but can be a great place to emphasize how your particular skills match the position you are applying for or your passion for the position. You might mention your organizational skills for an admin position or your hobby of building websites for friends in a resume for a job in the IT department. As you assemble your resume, you may be surprised to find out how much you can include. Remember to always highlight achievements (for instance, "raised $5,000 through end-of-season baseball team event, 15% more than in previous years") rather than simply listing tasks ("responsible for baseball team fundraising"). This is an example of a resume for an entry level position. Download the entry level resume template (compatible with Google Docs and Word Online) or see below for more examples. Energetic and responsible emerging professional, positioned to contribute to environmental conservation initiatives in Park Ranger I role requiring excellent physical stamina, dedication, and a deep love of the outdoors. Wilderness Literacy: Well-versed in wilderness literacy and survival methodologies including orienteering, wilderness medicine, rock-climbing, river navigation, and adventure planning. Certified in CPR and First Aid. Recreational Land Use: Solid training and experience leading both children and adults in outdoors recreational activities including hiking, nature walks, backpacking, camping, swimming, and skiing. Communications / Education: Actively engage interest in outdoor adventures through dynamic oral and interpersonal communications. Utilize active listening skills to assess and respond to individuals’ needs. Technical / Mechanical Skills: Computer proficiencies include Microsoft Office Suite and GPS software. Skilled in use and repair of trail maintenance and gardening equipment. Completed physically challenging semester-long wilderness immersion experience through mountainous terrain in Joshua Tree National Park. PALS Program: Participated in multiple activity-based courses including skiing and snowboarding, fitness, and aquatics. As Volunteer for “Watch the Wild” program, conducted daily assessments of local parks, weather, and wildlife activity, analyzing and reporting findings via online portal. Recruited 25 new volunteers for Nature Abounds program through active communication of non-profit mission and goals to local community groups. Built loyal network of clients for independent lawn, garden, and pool maintenance services. Provided attentive, high-quality customer service leading to referrals that generated over 50 ongoing clients. 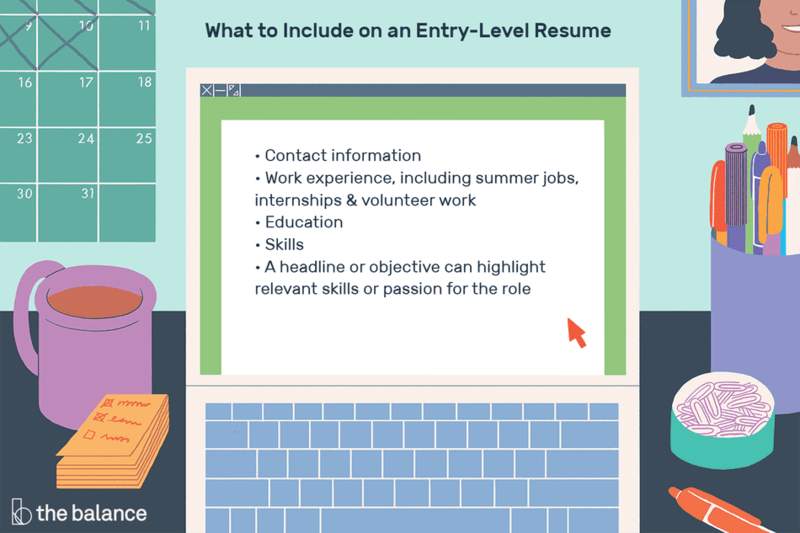 Review more entry-level resume examples for a variety of employment opportunities. Entry Level Business Resume: This sample from a recent college grad/college senior emphasizes work experience gained from internships, with the goal of getting a job in finance or consulting. Entry Level Business / Technology Resume Sample: By splitting the experience section into "Business and Technology Experience" and "Other Experience," this resume showcases the full spectrum of skills developed through jobs while emphasizing the most relevant work experience. Entry Level Education / Teaching: Think creatively: If you're applying for a teaching position abroad, previous teaching experience is the most relevant information to list. But as you can see in this sample resume, demonstrating a passion for language or strong leadership ability is also helpful. Entry Level Resume Example Focusing On Coursework: In this sample resume, education is placed above experience because it's the most important qualification for the position. Entry Level Resume - General: This sample resume puts the focus on unpaid positions, from volunteer work to extracurricular activities, to build up the candidate's experience and demonstrate her responsibility. Entry Level Resume - Management: Emphasize accomplishments to add punch to your experience. This sample resume for an entry-level management job quantifies how the applicant has added value at every position she's held, from cashier-level to store manager. First Resume - No Work Experience: In this example, a high school student with no work experience includes achievements (such as honor roll) as well as volunteer work. High School Student Resume: In this sample resume from a high school student, the focus is on both formal and informal work experience as well as academic achievements. High School Resume - Summer Camp: A summary statement is a great way to get hiring managers' attention — see how to put the summary to work in this sample. College Student Resume: Here's an example of a straightforward resume from a college student, including accomplishments, education, and experience. College Senior: Here's an example of how a college senior can include education details.